Though having a little bit of excess clutter in the home is relatively normal, some seniors end up with a huge collection of things that are ultimately useless in their lives and only take up precious space. Too much clutter can even be hazardous to a senior’s health. Harrisburg senior care experts discuss a few strategies to help your elderly loved one get rid of the unwanted “stuff” in his or her life. Decluttering a home can be stressful enough on its own, but you shouldn’t wait until the issue becomes unmanageable or dangerous. Try to broach the subject with your loved one as early as possible and work in manageable steps. By doing this, everyone will have peace of mind knowing nothing important is getting thrown away or overlooked. Managing the decluttering process requires quite a bit of organization. Instead of relying on your own memory, keep a notebook with you at all times to jot down any important information you might need in the future. Your notebook should contain details such as where your loved one would like specific heirlooms to go when you come across them. After you have made some headway, you might want to set up a time for close friends and family members to come take a look at special possessions they might want. Your loved one may be much more open to the idea of decluttering the home if he or she knows cherished items will go to the people he or she cares about. If you happen to be short on time, send a quick list of the belongings to those who might be interested, and see if they want to pick them up later. There will likely be quite a few items left over after family and friends go through them. Though some things may need to be thrown away, others can be sold at a yard sale. However, once the items are out in the yard and people are making offers, the idea of losing these possessions may be heartbreaking to your loved one. No senior wants to see a tea set he or she has held onto for years go to a complete stranger. Enlist the help of another family member or Harrisburg caregiver who can take your loved one out for a movie or meal during the yard sale. 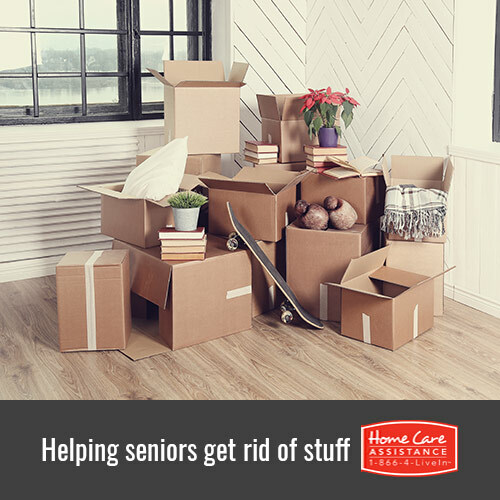 Even when getting rid of clutter is necessary for preserving a senior’s health, it can still be a stressful and emotional experience. If your loved one needs support during this difficult time, turn to Home Care Assistance. Our caregivers are compassionate companions, they can assist with a wide array of daily tasks, and they are also trained to provide specialized Parkinson’s, post-stroke, and Alzheimer’s care Harrisburg seniors and their families can count on. For more information and to schedule a complimentary consultation, please call a Care Manager at (717) 540-4663 today.